There’s not much which is worse than finding mould growth on curtains, walls, ceilings or bedding. However, our surveyors are called on to help with distressing mould growth on a regular basis. This is at odds with our childhood experiences, when mould growth was something only to be found on bread, or cheese. So, what’s changed? Is it that there are new types of mould, or that mould has evolved to grow in places where it couldn’t in the past? No, there is no evidence for that. This means that there is only one possible reason for the virtual explosion of mould growth we are seeing in houses these days. This is that the conditions in modern and modernised traditional homes, now favour mould growth. They didn’t in the past. In effect, whilst we’ve made our homes more comfortable for ourselves than ever before, we’ve made them attractive for mould growth too. The way we live in them is completely different to the way we used to, back in the mid- 20th century and earlier. These changes, such as air-tight homes, bricked-up chimneys, fuel poverty, draught exclusion and higher water vapour production (showers and laundry), have changed our indoor air quality – for the worse. The end result is mould growth, sometimes on an epic scale. The national press regularly reports on mould, sometimes with lurid tales of illness and even death, attributed to mould growth. There are now American style ‘certifed mould experts’. They are happy to tell you, that if there is mould in your home, you need to evacuate it and get the house sterilised to operating theatre standards (by them of course). In the past mould was something we’d just wipe off, if we ever found it at all. Where is the truth about mould growth? Well, there is no doubt that mould is unsightly, smelly and very unpleasant. Research has shown that high levels of mould in homes can worsen some health issues like Asthma and other respiratory problems. The World Health Organisation has stated that damp houses (usually those with mould growth), are generally bad for health. In acute cases there are individuals who are at high risk of harm, such as those who are allergic to mould and people with damaged or depressed immune systems. That said, mould spores are part of the natural flora; they’re in every breath we take and we’ve lived side by side with mould for thousands of years; mostly with no ill-effects. Invisible mould is one thing though; visible mould on our personal effects, ceilings and walls should never be tolerated. Are the extraction fans working as designed? In this case – NO! In the light of the above it is clear that what is required to reduce mould growth, is a change in the environmental condition in our houses – so that mould spores germinate and grow elsewhere, outside where they belong. This is where our expert specialist surveyors can help. The focus is not on the mould itself. It doesn’t matter what species the mould is or where it came from. What matters is “why is it growing here?” Mould can only grow where conditions suit its needs. Find the source of moisture and eliminate that and you cure the mould growth problem for good. Then it really is just a case of wiping it off – it will not come back. The location, pattern and distribution of the mould help an experienced surveyor gain insight into why the mould is there. So does the design of the building, the number of people in it, the heating regime, construction defects and of course the levels of water vapour and ‘damp’ which are present. To do this our surveyors carry a wide range of equipment and specialist tools. These include thermal imaging cameras, electronic hygrometers (for measuring the invisible water vapour present in the air), moisture meters and even anemometers, for checking extract fans correctly. 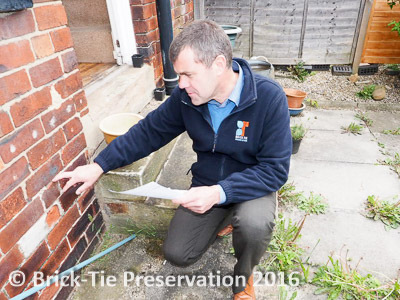 They are trained and qualified damp surveyors, as well as trained in indoor air quality, ventilation and thermography too. No house or flat is the same and every home needs to be checked in a holistic way, so that everything is taken into account before any decisions on treatment are made. 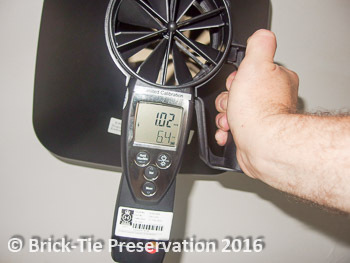 Our indoor air quality service meets every aspect of mould growth elimination. We survey the house properly, find the reasons why mould is growing and only then do we specify exactly what is needed to eliminate the mould growth – for good. Visit our indoor air quality and ventilation service page here. read on for more details….